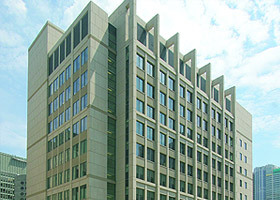 The Robert H. Lurie Medical Research Center is a state-of-the-art 455,000 square foot medical research laboratory, which includes extensive lab spaces, vivaria, and other specialty areas. E Cube completed construction phase commissioning on this research center, which is located on Northwestern University’s downtown Chicago campus. Facility systems include a 5,500 Ton central chilled water plant with both centrifugal and absorption chillers (2 absorption chillers at 1,500 tons each and 1 dual-compressor centrifugal chiller at 2,500 tons), hot water heating from existing campus steam, variable-air-volume air distribution and ventilation (Centrifugal fans with VFDs and 100% OA – RA for office lobby and classrooms), and a central DDC building automation system. Specialty systems include Strobic exhaust fans, Phoenix air valves and lab controls, diurnal lighting controls, RO automatic animal watering system and ventilated cage racks. For this project, E Cube’s commissioning services included the following systems: mechanical, electrical, plumbing, building automation, life safety, and laboratory fume hoods and gases.